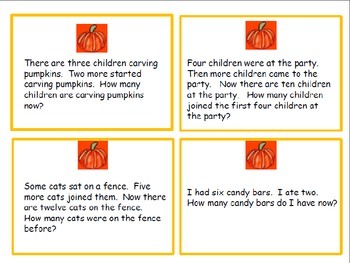 There was an extra question mark in the original Halloween Story Problems. This is just the one page corrected. I am offering this page for free but make sure you get all the problem types for your students by buying the original for only $3. This fun, Halloween math download provides you with all of the addition and subtraction problem types. This can be printed and laminated for multiple uses such as, math centers, partner work, independent practice and homework.